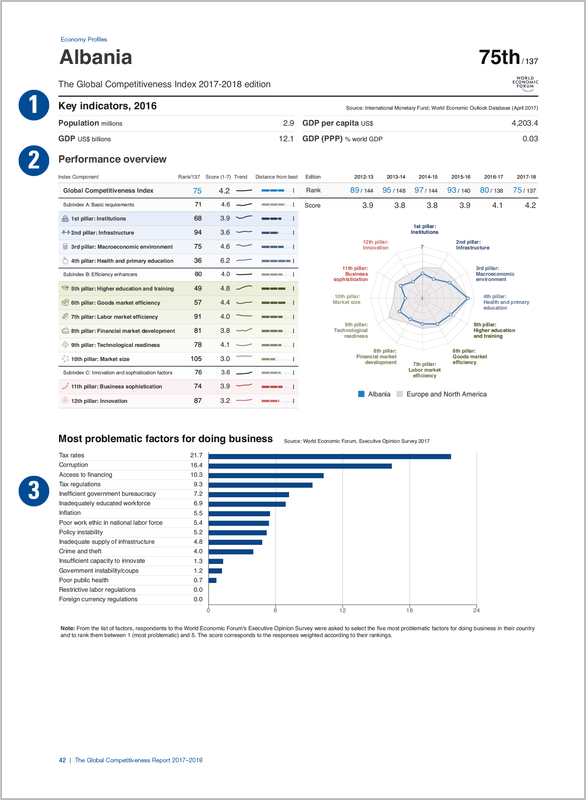 The Economy Profiles section presents a two-page profile for each of the 137 economies covered in The Global Competitiveness Report 2017–2018. The first section presents a selection of key indicators for the economy under review. All data in this section are for 2016 and sourced from the April 2017 edition of the International Monetary Fund (IMF)’s World Economic Outlook (WEO) Database. This section details the economy’s performance on the main components of the Global Competitiveness Index (GCI). 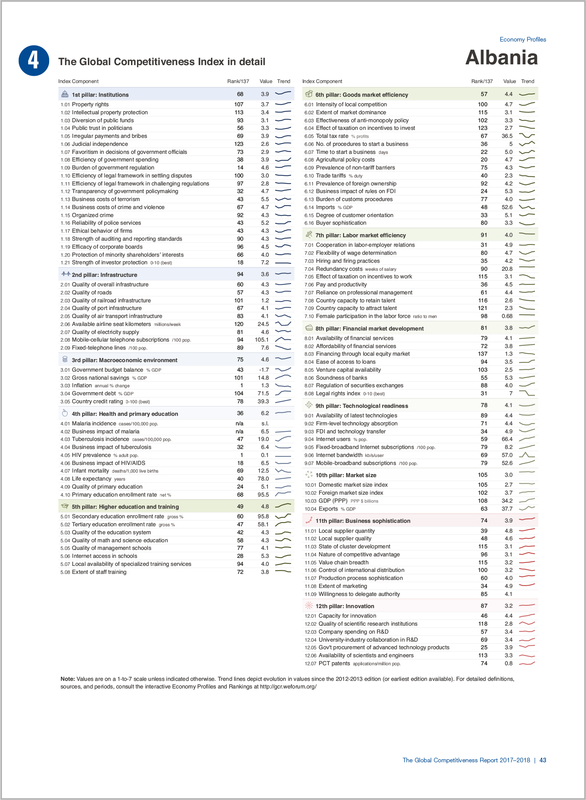 The table at the top of this section shows the economy’s overall GCI rank and score, and its evolution since the 2012–2013 edition (or the earliest edition available). Below, the left-hand side shows a table with a breakdown of the economy’s performance in the 12 pillars of the GCI. The right-hand side charts the economy’s score in each pillar (blue line) measured against the region’s average scores. See page ix for group composition. For selected economies, a brief commentary of the performance appears at the bottom part of this section. This chart summarizes those factors seen by business executives as the most problematic for doing business in their economy. The information is drawn from the World Economic Forum’s Executive Opinion Survey (the Survey). From a list of 16 factors, respondents were asked to select the five most problematic and rank them from 1 (most problematic) to 5. The results were then tabulated and weighted according to the ranking assigned by respondents. This page details the country’s performance on each of the indicators entering the composition of the GCI. Indicators are organized by pillar. For indicators entering the GCI in two different pillars, only the first instance is shown on this page. See Appendix A for the detailed structure of the GCI and methodology. Indicators derived from the Survey are always expressed as scores on a 1–7 scale, with 7 being the most desirable outcome. For those, units are omitted for the sake of readability. For indicators that are not derived from the Survey, the units are displayed next to the indicator name. A line depicts the evolution of this value since the 2013–2014 edition of the Report (or the earliest period available). Interactive profiles and sortable rankings with detailed meta information, as well as downloadable datasets, are available at http://gcr.weforum.org.